Thank you for the detailed report, I'm working on the bugs already. I thought that was the case, but be careful that you are not using an online slang dictionary! The phrase does have both meanings (I'm sure you can see how they are connected! ), but they are both slang and not for use in polite company. beetlenaut wrote: I thought that was the case, but be careful that you are not using an online slang dictionary! The phrase does have both meanings (I'm sure you can see how they are connected! ), but they are both slang and not for use in polite company. That is why telling us is especially appreciated - thank you. For the other english errors: I guess the problem is not so much in knowing the corrections but in knowing where the errors are. That is why we always encourage corrections. In scenario 14, the undead should be attracted by Clyde's light. Fixed a bug in scenario 15 that made it impossible to blow the damm. Some more bugfixes and spell corrections in scenario 1. The problem of Elizabeth being too aggresive in scenario 11 has not been solved yet. Thanks for you quick attention! 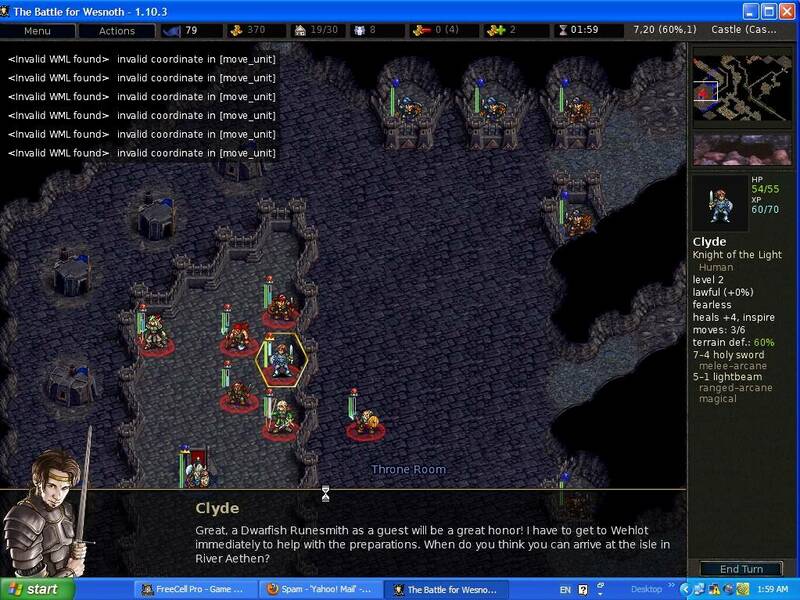 I was using Wesnoth 1.10.3. I was trying the simplest difficulty of Fellowship of the Clay. Clyde had visited the dwarf king, and was now searching for the missing scientist in order to find out the way to open up the treasure room. In the caves, the gryphon ended up being killed by a spider. Right after that, the scientist was heard saying that now he would have to travel without the gryphon. This seemed odd, because the scientist had not yet been located. Things continued normally until the point when Clyde had brought the scientist back to the king of the dwarves to open the treasure room. Everyone was talking about the scientist mounting on the gryphon to visit the new city, although the gryphon had been killed a long time ago and was no longer around. When the scientist tried to mount the non-existent gryphon, I ended up in a loop which stopped the game and allowed no exit. It seems that you would like to have your campaign translated, but two of its files (scenario fourteen’s and scenario eighteen’s) are not in UTF-8, thus I am unable to generate translation catalogues from what is uploaded to WesCamp. Something like Notepad++ should be able to convert them to UTF-8 (use the “Convert to UTF-8 without BOM” feature in its Encoding menu if you choose to try doing it with Notepad++). If you can’t fix them yourself, I’ll gladly send you fixed versions of the files in question. nathanson1947 wrote: I was using Wesnoth 1.10.3. I was trying the simplest difficulty of Fellowship of the Clay. Clyde had visited the dwarf king, and was now searching for the missing scientist in order to find out the way to open up the treasure room. In the caves, the gryphon ended up being killed by a spider. Right after that, the scientist was heard saying that now he would have to travel without the gryphon. This seemed odd, because the scientist had not yet been located. Things continued normally until the point when Clyde had brought the scientist back to the king of the dwarves to open the treasure room. Everyone was talking about the scientist mounting on the gryphon to visit the new city, although the gryphon had been killed a long time ago and was no longer around. When the scientist tried to mount the non-existent gryphon, I ended up in a loop which stopped the game and allowed no exit. The gryphon is later needed for the determination of some hexes which are used to move units, and as the gryphon no longer lives there is no movement but error messages. I've not yet finished it, however, I'm starting to forget the encountered bugs so better to report before they sink into oblivion. There were quite a few typos. Unfortunately, I can't recall all of them, only two: once at some point around "Bad News", fellowship is misspelled as fellowhip (I remember this one because it used to be present in this very thread's title too). And a recurring one is planed as the past simple/past participle for to plan. Correctly, it's planned. Feyndwarf's gryphon is usually mentioned as Richard (why not Richard P., by the way?) but the unit's name itself remains Wild Gryphon. Mounted Feyndwarf's attack frame, even if not animated, could use a sound. I was unable to unmount Feyndwarf in Dragnet Operation. Harriett's portrait doesn't appear anytime after the duel with Henry. Harriett's defend animation uses male hitsounds. Feyndwarf loses team color after advancing to Arcanister. In Bad News, I was able to assassinate the northern necromancer with the nearby units (and no prticular luck) before he could start recruiting. The rest of the scenario was sort of easy after that (playing on normal difficulty). I'm not sure what the trolls in Dark Walks are supposed to do, but they don't do anything. And I believe that there were some more, but they can't be that important if I can't remember them... besides these, I like the campaign very much! lipk wrote: once at some point around "Bad News", fellowship is misspelled as fellowhip (I remember this one because it used to be present in this very thread's title too). lipk wrote: And a recurring one is planed as the past simple/past participle for to plan. Correctly, it's planned. Found two occurrences, fix comming. lipk wrote: Feyndwarf's gryphon is usually mentioned as Richard (why not Richard P., by the way?) but the unit's name itself remains Wild Gryphon. Noticed that myself... let's see what we can do about it. About the "P.": I say because of "KISS"
lipk wrote: I was unable to unmount Feyndwarf in Dragnet Operation. lipk wrote: Harriett's portrait doesn't appear anytime after the duel with Henry. No? Damm! Eventualy, she is a lovely girl! lipk wrote: Harriett's defend animation uses male hitsounds. lipk wrote: Feyndwarf loses team color after advancing to Arcanister. lipk wrote: In Bad News, I was able to assassinate the northern necromancer with the nearby units (and no prticular luck) before he could start recruiting. The rest of the scenario was sort of easy after that (playing on normal difficulty). True, this can happen. To make it even worse: If you "park" a unit at the spawn point of that necromancer, he doesn't spawn at all. We just thought it to be very unlikely that there would be enough unit up there...hmm. lipk wrote: I'm not sure what the trolls in Dark Walks are supposed to do, but they don't do anything. You are supoosed to move zigzag through the map, following the bridges. Did you do that? Cause that you naturally end up in front of thier door and have to deal with them. At least on hard, it would indeed be quite impossible not to evade the undead in the main canyon that is why I am quite interested, if you did that on normal. The trolls are set not to move into the canyon cause otherwise they block the bridge and you are stuck in the canyon. lipk wrote: And I believe that there were some more, but they can't be that important if I can't remember them... besides these, I like the campaign very much! Thanks a lot for your corrections and the compliment. UPDATE: I just uploaded version 1.0.8 with the mentioned corrections. I see that you just fixed some errors, but there is something else I would like to mention. It's a small thing, but you are not able to undo any move in the campaign, which can be annoying at times. That can be fixed by putting [allow_undo] into the moveto events for mounting and unmounting. (I did that for my version which is why I forgot about it.) Maybe you could add that next time you have a bug report. I should probably go over the whole mounting code again anyway, because I wrote it one and a half years ago and I got some more WML experience since then. If you are going to change it anyway, there is another improvement you should consider. See if you can make it possible to mount, unmount, or teleport without moving first. Maybe it would be possible to a select event instead of a moveto one. Maybe you could just put them all in a start event and use showif for all the different possibilities. You could also put the illumination on/off menu item under a select event to keep the right-click menu from being crowded. Finished. I'd say it was the best campaign I played recently, but it'd be quite meaningless regarding that I haven't really played anything else in the last few months. It's not a hold-your-breath-this-is-amazing kind of campaign, but all the little goodies make it an excellent one (German quality, if I may say so ). Congrats. Well, I started by zigzagging, but when I realized how stupidly the undead behaved I continued in the canyon instead to harvest some XP. It might be a good idea to refine the AI not to go outside the canyon, but do attack you if you're down there. Back on topic, the bulk of my army never got close to the trolls, but when I neared them with Clyde, they ran back into the cave. This was what I found strange. The last scenario was a bit too easy with all my level threes there, I finished it in less than 20 turns. The only nitpick I could mention is the light runes. If you fly next to the tower with Richard, and then dismount Feyndwarf to the hex, you won't get the lights switched on. I didn't look in the code, but I guess it would be entirely possible to fire a moveto event in the dismounting code, which would solve this issue. Oh, and something I forgot to mention the last time: in Reaching the Mountain Top, I found nothing less on my recall list than one of those legendary - hold on - Fog Clearers. Unfortunately, it turned out to be rather useless in combat . An UNCLEAR_FOG call is probably missing in the scenario before. lipk wrote: Well, I started by zigzagging, but when I realized how stupidly the undead behaved I continued in the canyon instead to harvest some XP. It might be a good idea to refine the AI not to go outside the canyon, but do attack you if you're down there. Back on topic, the bulk of my army never got close to the trolls, but when I neared them with Clyde, they ran back into the cave. This was what I found strange. My solution for having the undead walk through the canyon while they're not noticing you is a messy workaround using goto_x/goto_y. Right now, they don't even go in a straight line (as I would expect), but wander about completely aimlessly sometimes. I could probably do it with some AI magic instead, but I've got no idea about AI modding. So any contribututions for this are highly welcome. For the trolls, I could probably just turn aggression up to 1 and see if that helps. If you fly next to the tower with Richard, and then dismount Feyndwarf to the hex, you won't get the lights switched on. I didn't look in the code, but I guess it would be entirely possible to fire a moveto event in the dismounting code, which would solve this issue. Yeah, I forgot an UNCLEAR_FOG there.